The wolves’ return to Yellowstone and the subsequent recovery of plants that elk had been eating to death in their absence has become one the most popularized and beloved ecological tales. By the 1920s humans had misguidedly wiped out most of the wolves in North America, thinking that the only good wolf was a dead one. Without wolves preying on them, elk and deer (also called ungulates) exploded in number. 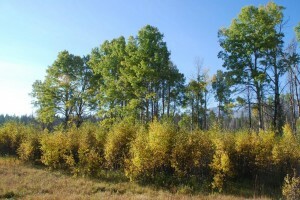 Burgeoning ungulate populations ravaged plant communities, including aspen forests. Decades later, the wolves we reintroduced in Yellowstone hit the ground running, rapidly sending their ecological effects rippling throughout the region, restoring this ecosystem from top to bottom. Yet today some scientists caution that this story is more myth than fact because nature isn’t so simple. For decades scientists have been investigating the ecological role of wolves. In his 1940s game surveys, Aldo Leopold found ungulates wiping out vegetation wherever wolves had been removed. He concluded that by controlling ungulates, wolves could restore plant communities and create healthier habitat for other species, such as birds. Since Leopold’s time, many scientists have studied food web relationships between top predators and their prey—called trophic cascades. In the 1960s and 1970s Robert Paine, working with sea stars, and James Estes, working with sea otters, showed that ecosystems without top predators begin to unravel. John Terborgh called the ensuing rampant species extinctions an “ecological meltdown.” Paine created the metaphorical term keystone species to refer to top predators and noted that when you remove the keystone, arches and ecosystems collapse. Over the years ecologists found trophic cascades—also called top-down effects—ubiquitous from coral reefs to prairies to polar regions. However, William Murdoch and others have maintained that sunlight and moisture, which make plants grow, drive ecosystem processes from the bottom-up, making predators relatively unimportant. The Yellowstone wolf reintroduction provided the perfect setting to test these contrasting perspectives. In the mid-1800s in his book The Origin of Species, Charles Darwin presciently described nature as a “tangled bank.” Nature’s complexity results from myriad species and their relationships with other species and all the things that can possibly affect them individually and collectively, such as disease, disturbance, and competition for food. Science works incrementally, taking us ever deeper into nature’s tangled bank as we investigate ecological questions. Each study answers some questions and begets new ones. Sometimes we find contradictory results. Learning how nature works requires what Leopold called “deep-digging research” in which we keep searching for answers amid the clues nature gives us, such as the bitten-off stem of an aspen next to a stream where there are no wolves. Browsed aspens in high predation risk area, Waterton Lakes National Park. Photo by Cristina Eisenberg. Trophic cascades science that focuses on wolf effects is still in its infancy, with huge knowledge gaps. 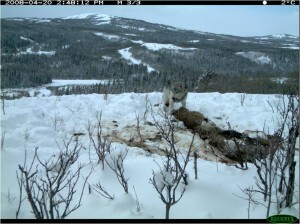 For example, we’ve linked wolves to strong effects that cascade down through multiple food web levels. However, we’re just starting to parse how context can influence these effects. Some Yellowstone studies have found that wolves have powerful indirect effects on the plants that elk eat, such as aspens, due to fear of predation. With wolves around, elk have to keep moving to stay alive, which reduces browsing pressure. Conversely, a growing body of studies are finding no wolf effect—that aspens in places with wolves aren’t growing differently than those where predation risk is low. 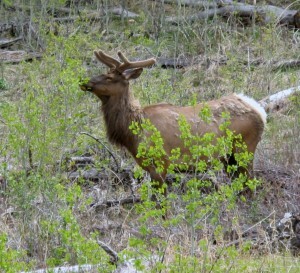 Other studies have found that wolf predation risk doesn't affect elk feeding behavior. In my own research I’ve found that wolves need another keystone force—fire—to most effectively drive trophic cascades. With wolves and fire present, elk herbivory drops, aspens thrive, and biodiversity soars due to the healthy habitat created by young, vigorously growing aspen. Aspen growing above elk reach after fire and wolf recovery, Glacier National Park. Photo by Cristina Eisenberg. It’s human nature to try to find simple solutions. Today we are grappling with monumental environmental problems such as climate change and habitat fragmentation. Due to the wolf’s iconic status and our need to fix broken ecosystems, the environmental community and the media have run with the science that shows a strong wolf effect. This has inspired other scientists to prove that ecosystems are more complex than that. These dissenting studies demonstrate that the wolf dwells in a tangled bank, working alongside many other ecological forces. Tangled banks seldom yield simple answers. However, arguing about what exactly carnivores do ecologically and why we need them is fiddling while Rome burns. Large, meat-eating animals improve the health of plant communities and provide food subsidies for the many species that scavenge on their kills. A system with wolves in it is far richer than one without and can support many more grizzly bears, coyotes, wolverines, and eagles. There are things we don’t know and disagreements about what we do know. But given the accelerated human-caused extinctions we are experiencing today, a precautionary approach to creating healthier ecosystems means conserving large carnivores. Beyond empiricism, scientists often operate based on instinct. Instinct led Darwin to dig more deeply into species adaptation and Leopold to doggedly delve into the effects of predator removal. For many of us who conduct trophic cascades science, our instincts are telling us that wolves should be conserved in as high a number in as many places as possible, due to the invaluable benefits they can bring to ecosystems. To do anything other than conserve wolves would be foolish, given all we’ve learned thus far.